Benchmark Pizzeria gives pizza and pasta lovers a reason to go to Kensington. 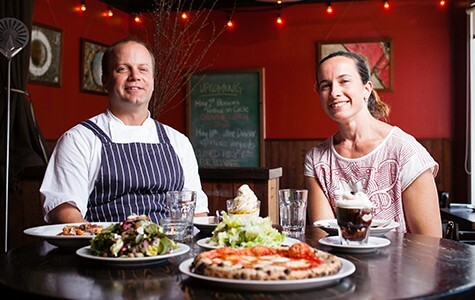 Owners Peter and Melissa Swanson sit down for a meal at Benchmark Pizzeria. Hours: Mon.–Thu. 5–9 p.m., Fri.–Sat. 5–9:30 p.m.
With apologies to Alice Waters of Chez Panisse, it is the Cal-Italian restaurant that is, in many ways, the quintessential East Bay eatery. 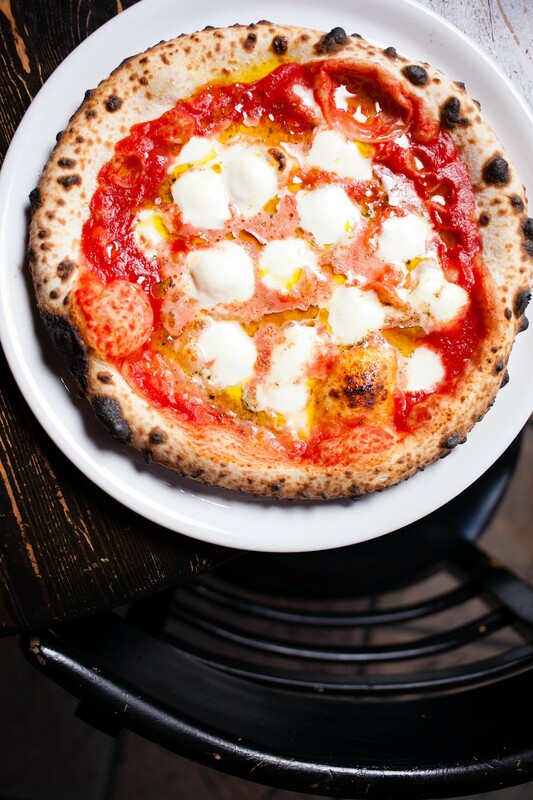 There's a reason why places like Dopo and Pizzaiolo — two of the first restaurants I fell in love with in Oakland — remain reliable favorites for Town natives looking to impress out-of-town guests. It's a simple formula for success: gorgeous salads, seasonally-topped wood-fired pizzas, and maybe a pasta dish or two. Rinse and repeat. But there's one Cal-Italian restaurant you may not have heard of, despite the fact that it has been open for four years, with a chef who is an alumnus of such well-regarded restaurants as Oliveto and Dopo. That's because — well, it's in Kensington. 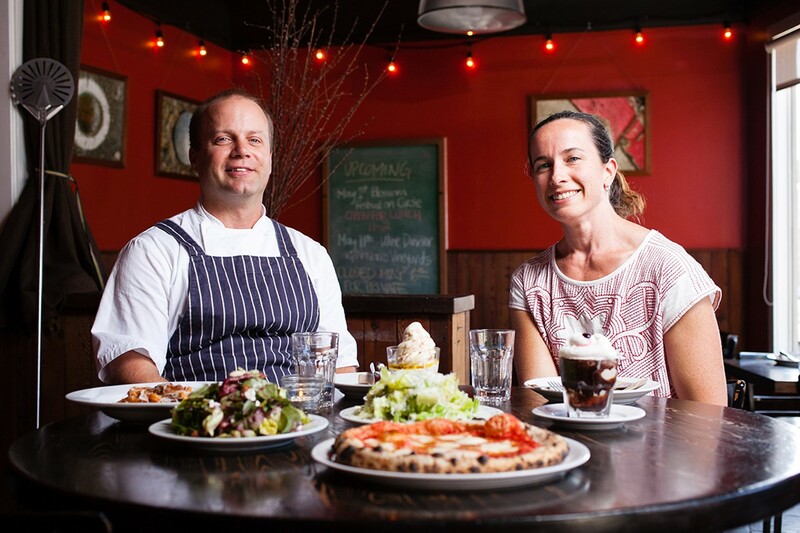 Husband-and-wife team Peter and Melissa Swanson opened Benchmark Pizzeria in 2012 in the quaint little traffic circle that constitutes Kensington's main commercial strip. Melissa, who runs the front of the house, has worked as a host and server at various East Bay restaurants, including Oliveto. That's where she met her husband, Peter, who worked as a line cook there until he left to help launch Dopo as its opening sous chef. The Bay Area has no shortage of high-quality wood-fired pizza, but Benchmark's is good enough to merit special recognition. Swanson describes the style as "Neo-Neapolitan," which really just means the chef takes a certain number of liberties with both the toppings and the crust. The signature "Benchmark" — Swanson's take on a classic margherita pizza — is fairly traditional: fresh mozzarella that the chef hand-stretches in-house each morning, a simple tomato sauce, high-quality California olive oil, and a scattering of dried Sicilian oregano. (Basil, margherita pizza's standard greenery, is only used in season.) Other pies paid no mind at all to the officially sanctioned ingredient list of the True Neapolitan Pizza Association (a real thing), even if the flavors were still more or less Italian — pizza topped with sage and brown butter, or sausage and radicchio. Diners who don't mind a bolder-tasting pizza will dig the pie that married the bright fruitiness of Calvestrano olives with the pungency of whole anchovy fillets. What I loved most about the pizzas was the crust itself, which was thicker and quite a bit chewier than the kind of floppy, "knife-and-fork" pizza typically associated with the Neapolitan style. These are more of a hybrid: Cooked in the wood oven at around 800 degrees Fahrenheit, the pizzas come out blistered — or "leoparded," in pizza-making parlance — enough to please any thin-crust connoisseur. But the crust is also sturdy enough, and crisp-bottomed enough, that you can fold it in half and eat it like a New York slice. One advantage Benchmark has over its more famous Oakland counterparts is that the food is less expensive. The restaurant's daily prix-fixe is one of the better dinner deals around: $18 for the Benchmark pizza and a salad, which could easily feed two diners of modest appetite. Go for the Caesar — a big mound of well-dressed romaine hearts showered generously with curlicues of Parmesan cheese. What's notable, too, is the way the restaurant sometimes veers away from the usual Cal-Italian flavor palette. For instance, a salad of spicy carrots was a showcase for intensely sweet shredded carrots, golden raisins, almonds, and mint. The ingredient list read Middle Eastern, but the bright acid and chili heat reminded me of Thai-style papaya salad more than anything else. Other times, the menu might feature dishes from Swanson's childhood in Georgia — boiled peanuts or pickled green beans, for instance. And while avocado toast is one of those on-trend Californian dishes that you'll find at dozens of Bay Area restaurants, Benchmark's is the only one I've eaten that had a thick slice of deep-fried bread as its base and that featured the spicy tang of a pickled Calabrian chili spread. My only complaint was that it was awfully difficult to eat: The bread was so crispy that we were given a serrated steak knife to slice it up, and because the avocado was presented as large slices instead of the usual mash, the whole thing tended to fall apart. On the other hand, the rotating selection of three or four fresh pasta dishes aren't so much a vehicle for creativity as they are rustic comfort food — pure and simple. Spaghetti carbonara has long been one of my favorite pasta dishes, in part because it was one of the first things I learned how to cook, yet I rarely see it served at restaurants. So, it took me about one second to decide to order Benchmark's very spring-like version, which came tossed with chopped asparagus and cubes of smoky pancetta. My only regret: The rich, egg yolk-based sauce came pre-mixed, denying me the pleasure of stirring in the raw yolk myself — my favorite part of eating a carbonara. The best of the pasta dishes was the strozzapreti Bolognese, which features my favorite pasta shape name — the Italian, translated literally, means "priest stranglers," and is one of those food words with an entomology that has a half-dozen apocryphal explanations. No matter: The narrow crevices of these squiggly, double-barreled noodles were ideal for picking up bits of the classic Bolognese — an extra-savory mix of Marin Sun Farms ground chuck, pancetta, tomatoes, and thin shavings of Parmesan that melted into sauce. One of the most striking things about Benchmark is how kid-friendly it is. If you dine on the earlier side, you'll find that a toddler presides over nearly every table. The kids' menu, which includes kid-safe pizzas that are just as big as their grownup counterparts, is one of the most appealing in the East Bay, and the entirety of the dessert menu — with its Coke floats, chocolate chip cookies, and soft-serve ice cream sundaes — is like an eight-year-old's dream come true. More than anything, I appreciated the warm, easy-going service and the way the restaurant felt more approachable and less precious than many of its Cal-Italian counterparts in Oakland or Berkeley — despite the fact that the food was just as good and the sourcing of ingredients just as conscientious. The bottom line: Now I have a reason to go to Kensington.